Incoming text. Snapchat alert. Netflix flashing in the background. Music blaring. A computer screen with flashing alerts from Instagram and Twitter and Vine. This is the life of the 21st-century teen. They are connected. But there are different types of connections. There are connections of multitude and connections of depth. And sadly, many of our students don’t know how to connect with depth of attention. They depend so much on constant stimulation that they are often convinced that their brains work best with multitasking. 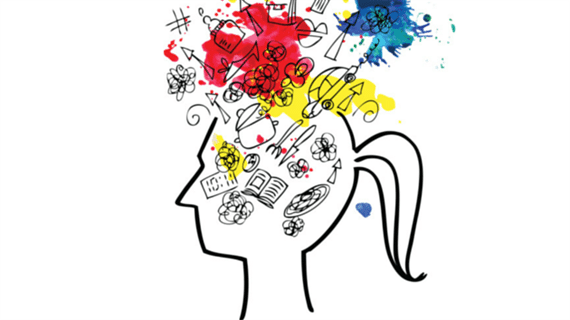 If, however, you know anything about multitasking from a cognitive standpoint, you know that it is largely a myth. We cannot attend to more than one cognitive stimulus at a time. And, many argue that this insistence in multitasking does some real damage to the learning process. 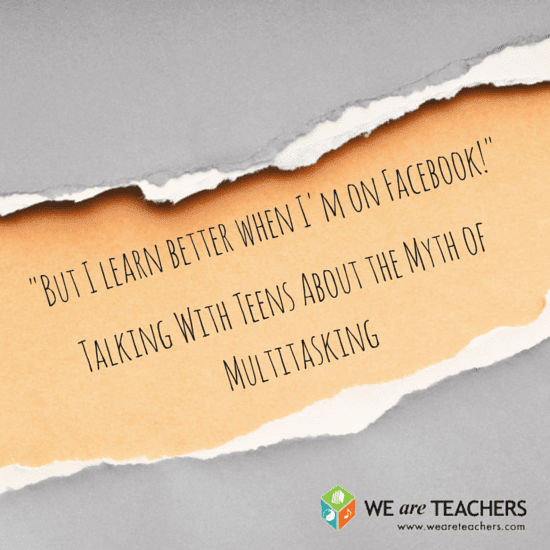 The challenge we often face is how to prove this myth to students – beyond just berating and lecturing them to put their phones away during class. We have to show them, not simply tell them. And the easiest way to show them? Run an experiment that pits divided attention against focused attention. Read further for a quick lesson that shows the effects of multitasking. For this experiment, we will be comparing the effects of divided attention versus focused attention. You will attend to two different cognitive tasks. Task 1: For the first task, grab a sheet of paper and a pen. You will be writing a story. Your story can be about anything: How your day was, “The Three Little Pigs,” anything. Allow students to set up materials. Task 2: While performing task one, you will have another simple task: Count backwards in increments of “1” from 200 to 1. 200, 199, 198. And, do so out loud. As students are performing this set of tasks, time them to see how much they accomplished in 4 minutes. At the end of round 1, jot down what number you ended at and how many words you wrote. You will attend to one task at a time. You will spend two minutes on task one. Then, I will announce for you to switch and spend two minutes on task 2. Task 1: You will once again write a story. Please make your story about something different than in round 1. Task 2: Count backwards from 200. After 4 minutes, jot down how many words you wrote in task one and the number on which you ended your count. Discuss your findings! 2. With your right hand, prepare for a thumb-war. 3. While you are engaging in a thumb war, your left hands will simultaneously play continual games of rock-paper-scissors. Enjoy the challenge! You lie teacher! What about the whole rub your belly and pat your head thing!? I can do both those at the same time. Muh ha ha ha! Yes, with practice, you can. This is possible because you are using procedural memory in these tasks (And, there is a difference between explicit memory and a procedural memory). Procedural memory involves our muscle memory. And, the major goal of our human brain is to convert as much as we can to muscle memory so we don’t have to think about it consciously. This is why we can walk and talk at the same time – we can step and breath and move our arms without having to think about these movements (Imagine how painfully slow life would be if we couldn’t walk on autopilot). Need another example? Try mixing up your shower or morning rituals. Most likely, you have habits you don’t think about, such as the order in which you shampoo, condition, body wash. You probably even brush your teeth in the same pattern each day – without consciously thinking about it. Sadly, most of what we are learning in school and in life is not simply procedural. But I work better when I listen to music! I NEED it! B) Singing along to a song – even silently in your own head. (Ever accidentally typed a song lyric into an essay?). If you want to listen to music, consider making a playlist of non-lyrical music. You’ll get the benefits without the costly divisions of attention. It is possible to do two things at once. However, multitasking is simply switching our attention back-and-forth quickly between two cognitive tasks. And, when we divide our attention, we make more mistakes and take longer in completing the tasks. Imagine how much more time you would have to enjoy listening to your music and texting if you just focused your full attention on one task (school work) for a set amount of time. You can, therefore, study while jamming to music, blaring some TV, texting, snapchatting, and surfing the web all at once. But, plan to spend a lot more time studying – and poorly at that. And, who ever said they wanted to spend more time studying? Chase Mielke is a learning junkie who happens to have a love affair with teaching. A book addict by night and a teacher and instructional coach by day, he fantasizes about old libraries and fresh Expo Markers. His obsessions with psychology, well-being, and cognition often live on his blog, affectiveliving.wordpress.com. Chase Mielke, author of "What Students Really Need to Hear, is a learning junkie who happens to have a love affair with teaching. His obsessions with psychology, well-being and cognition often live on his blog, affectiveliving.com, where you can download a free ebook, "G-Words: 20 Strategies for Fostering Grit and Growth Mindset" Follow him on Twitter @chasemielke.